You might recall the feature on the Huawei Mate 20 Pro that allowed users to use the phone as a wireless charging pad (click on the video at the top of the article). Put another phone on the back of the Mate 20 Pro, and part of the power in the latter's battery will be wirelessly transferred to the other phone. We tested this feature using the Mate 20 Pro to charge a Samsung Galaxy Note 9, and found that the battery on the Samsung unit was charged up only 1% in 10 minutes. While this technology is new, and could come in handy, right now it is painfully slow. What brings up wireless reverse charging is a photo revealing that the feature will be offered on the Samsung Galaxy S10 line. 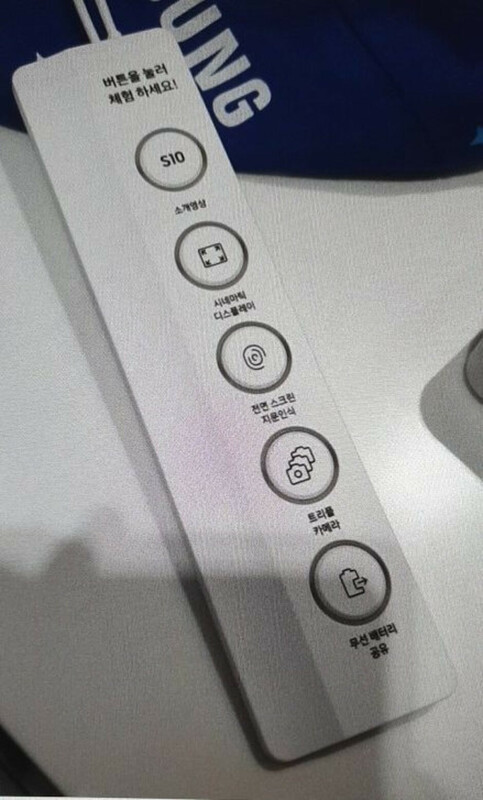 A picture on the Samsung Members community site (via Techtastic-translated) shows buttons on a controller that visitors to a Samsung demo booth will press in order to view certain videos related to the upcoming Samsung Galaxy S10. Pushing the button on top plays an introductory video about the phone. The second button shows off the handset's cinematic display, while the next one plays a clip showing off the in-display fingerprint scanner to be found on most of the Galaxy S10 models (the entry level Galaxy S10E will have a side mounted fingerprint scanner). The fourth button starts a video focused on the triple camera setup to be found on some Galaxy S10 models, and the fifth and final button starts a video related to the wireless reverse charging function on the phone. The new feature is expected to be called Powershare, and is not expected to be any faster than the wireless reverse charging found on the Mate 20 Pro. As a result, its usefulness is questionable, and many call it nothing but a gimmick. In addition, there is concern about the size of the batteries on the Galaxy S10 range, since any battery life added to a another phone using reverse wireless charging is subtracted from the battery on the Galaxy S10 unit providing the juice. The most recent rumors call for the Galaxy S10E, Galaxy S10 and Galaxy S10+ to be equipped with a 3100mAh battery, 3500mAh battery and a 4100mAh battery, respectively. The 5G enabled version of the Galaxy S10 will reportedly carry a 5000mAh battery. The battery inside the Mate 20 Pro has a capacity of 4200mAh. The wireless reverse charging feature on the Galaxy S10 line could be what Samsung was trying to promote in a video teaser for the company's Unpacked event, which will take place on February 20th. The teaser showed the image of a fully charged battery icon that could have hinted at the new phones' ability to charge up devices that support wireless charging. At next month's event, we should see Samsung introduce the Galaxy S10E (5.8-inch display, single cameras in front and back), Galaxy S10 (6.1-inch curved edge display, punch-hole camera in front, two sensors in back), and the Galaxy S10+ (6.4-inch display, two punch hole cameras in front and a triple-camera setup in back). Also expected to be unwrapped during the same event is the foldable Galaxy F.
The Galaxy S10 line is expected to launch on March 8th with a March 29th launch in South Korea rumored for the 5G version of the Galaxy S10. Said to be called the Samsung Galaxy S10X, according to rumored specs this unit will be equipped with a 6.7-inch Super AMOLED display, 10/12GB RAM and 512GB/1TB of internal storage. It is expected to carry the Exynos 5100 5G modem, and feature two cameras in front and four in back. After its release in South Korea, the S10X is expected to make its way to the U.S. (possibly as a Verizon exclusive at first) and other markets. May wanna hold off, until it's faster. Killing your battery, just to charge up another 1% in ten minutes...nahhh sonnn. I guess the real use of this feature is to mainly to charge your galaxy watch/wearable when its real low on juice. Because Huawei never copies other companies? I love the design of the Mate 20 Pro, but no one can deny the fact that it's the love child of the iPhone X and Galaxy S9. All companies copy each other, but you better improve on what you're going to copy, and in this case, if Samsung didn't improve on the reverse charging feature, then it'll be nothing but a useless gimmick. This is so true, people acting like Huawei invented the smartphone!!. They copy as much as all OEMs do. This is how technologies get improved and popularised. Just get over with it. Means another bland year for Samsung. Nothing new to bring to table. I would like a smartphone to lay eggs pls! I agree. In a pinch I may use this to charge up a smartwatch or wireless buds. Wouldn't use it to charge another phone though. Especially if it’s not mine lol. I carry both my Note 9, and Max together, so I don’t see where I’d really use that feature outside of what you listed. Yeah, I get that way too, and want to leave one at home. I like a lot about both, so I mostly carry them together. Regardless if there is cable involved iPad Pro excuted this feature much better than slow trickle charge of the Mate 20 Pro. USB-C to lighting yields significantly way better results. A feature that no one needs and no one asked for. Probably free to implement. Strap the Mate 20 Pro and S10 back to back and you get infinite battery. I see what you did there Samsung.